Did another cartoon for my friends at Project Blue Collar that work to give attention to adopted dogs. This one was fitting since their spokesperson er dog is named Sonny. 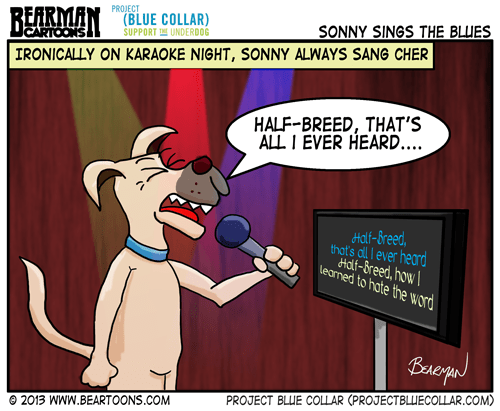 Sonny sings Cher’s song Half breed at a karaoke bar….get it? I read that little blurb at the bottom and thought it said you’d been busy eating your niece’s wedding video. David…blast from the past…you blogging again? Yessir. I just started about a month or so back. I’ve been trying out just doing a small blog with my comic and doing three a week instead of tackleing 100 different things. Awesome…can’t remember if I have an update banner ad but feel free to send me one and I will add it. I’d have to make one. I’m working on a whole redesign right now so as soon as I get it finished, I’ll send it your way. Makes perfect sense and a nice thing to do for Project Blue Collar. And video editing is a lot of work good to see you in the blogosphere. This is one of my favorite songs of hers. Fab toon. Don’t you just love when you get roped into “helping” with things? See, I never think of you as a mush. Sonny looks more like a Heinz (57 different varieties) than a half breed, Good one today, Your art is better with each new strip lately. Well there you go. Bwahahahahahahahaha. my last friend was an adopted Woof, loved him ..
Yeah. I have no clue what I was trying to do there. And congrats to your niece on her wedding! I wonder how much Sonny had to drink before he agreed to sing karaoke? How much does your husband drink before singing karaoke? Probably about the same. Funny. I like Cher and long ago when I was generations younger I saw them both in concert (they were still married then). Those that have never tried to edit video don’t understand. It’s very tedious. If Sonny and Cher were an act today, their biggest hit would be “I’ve got YouTube, Babe.” Nice work on the lights – transparent gradients, eh? Most of us are mutts. I never knew you used to edit videos. It can be rather tiring to cut everything just right. Just don’t let that dog go skiing! Eh, wait. Too soon? in a handbag Dave … in a handbag. No duet, like ‘I Bark You, Babe’? My mama says I’m a good Sonny so I Chered it. Your momma didn’t have to Chaz you all over the house did she? I’m guessing singing “How much is that doggy in the dumpster” was inappropriate? Great cause Bearman. and he’s wearing a blue collar for the cause. Good boy Sonny!!! He could have sung that ‘Shannon is gone’ song…hey, all dogs go to heaven, right? A guy wrote a song about his recently-deceased dog. Look it up on YouTube. Pretty easy to do once I figured it out. Now onto step two and sharing.